This article is a continuation of little stories in the life of Saint Gemma. The source of these stories is the book "The Gem of Christ- The Story of St Gemma of Lucca" by Father Francis C.P.., Published in 1949 by the Catholic Book Publishing Co. Part 1 of this article can be found here. There are times when the truth hurts. And there was a time when poor Gemma, the desti¬tute orphan, sick and dependent on charity, was cruelly lacerated in her sensitive heart by one who knew better. First, for the setting of this account we should recall that after Gemma’s father died (and Gemma’s mother had died when she was only 8 years old), she was taken in by the large Giannini family in Lucca. A Passionist Father on the way to the Giannini house met a religious, who accompanied him there. Gemma was the first person they met at the door, but before she could offer them her usual kind welcome, this religious broke out into a very passion of vituperation. Among other injurious epithets, he exclaimed: "You worthless consumptive, you rotten thing, when will you die and cease to defile this house by your presence?" Poor Gemma went white with humiliation, and having admitted the visitors with her customary calmness, she withdrew. After a while, when the religious had gone, the Passionist looked for Gemma to offer a word of apology and comfort. 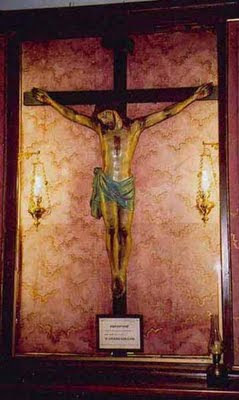 "I found her," he says, "in the dining room where there was a large beautiful Crucifix ... There she was on her knees wrapped in prayer. Later I saw her at dinner serving the table in her usual simple, modest, unaffected manner." Gemma had already found her comfort from the blow in prayer at the feet of her Jesus crucified. In the Scriptures we have our Lord saying: “A man’s enemies will be those of his own household” (Matt 10:36) and also “Where did He get all this Wisdom and these Miracles? Is not this the carpenters Son? Is not His Mother called Mary and His brethren, James and Joseph and Simon and Jude: and His sisters, are they not all with us? Then where did He get all this?" (Matt. 13, 54-56.) Hence, many of those who knew Jesus, and even some in His own extended family and in the town of Nazereth were simply bewildered by the transition from the ordinary to the extraordinary in His Life. Another time he [Ettore] gave her such a blow that the mark could be seen for many days. Her sister Angela (Angelina), three years younger than Gemma, was no lover of piety or virtue, and she had the disposition of a wildcat. "You are all bigots and hypocrites" she would say to Gemma and her aunts. Once Gemma reproved her for her habit of standing at the window - a rather serious fault against the modesty and reserve expected of a young girl at that time. She turned away from the window indeed, but only to rush upon Gemma in anger, and to dig her fingers into her hair and pull her about until the commotion brought the aunt on the scene. Later this unruly girl, unable to endure the piety and examples of virtue at home, went to board outside. But before she left, she was the cause of great suffering to her holy sister. "Monsignor, listen: I am almost in despair. Angela knows everything about me. This morning she spoke about my affairs as if they were nothing and my brother along with her made fun of them. I am not the least afraid of their ridicule, you know. But from eleven o'clock this morning until this hour, which is three o'clock, she has not left me alone. She says that she wants to see everything. She seems almost like a little devil. My aunts laugh at these things and I have a great desire to weep. She has even brought her companions from school into the house saying to them in order to make fun of me: 'Come, let us go and see Gemma in ecstasy.' And yesterday evening in front of the house she repeated these words in a loud voice." only by myself, no one else saw me: I cried so, so much, because my sister Angelina did not want to leave my room. Yesterday evening, Sunday, for spite, she stayed in my room until 11:00pm, making fun of me, saying that she wanted to see me go in ecstasy; today again the same thing. She wrote a letter yesterday to Bagni di S. Giuliano and spoke a lot about me and my experi¬ences. These things, which I should be accepting happily and with thanks to Jesus, instead upset me, and I almost have moments of despair. Then he calmed me, sat at my side, and said gently, very gently: "Oh daughter, don't you know that you must conform in every way to the life of Jesus? He suffered so much for you, don't you know that you must on every occasion suffer for Him? 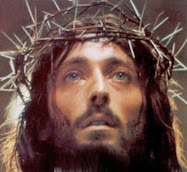 Furthermore, why do you give this displeasure to Jesus, of neglecting to meditate on his Passion every day?
" It was true: I recalled that I did a meditation on the Passion only on Fridays and Thursdays. "You must do it every day, remember that." Finally he said to me: "Be brave, be brave! This world is not a place for rest: rest will come after death; for now you must suffer, and suffer all things, to save some soul from eternal death." I begged him urgently to ask my Mother to come to me a little, because I had so many things to tell Her, and he said yes. But this evening She did not come." All of this was very painful to Gemma who was very reserved concerning the supernatural gifts that she was given, and she always wished to hide when she was drawn into ecstasy and hide also the Stigmata -these marks of Divine favor. In 1923, two Redemptorist Fathers were sent to give a mission at Acquerara in the rich coffee country of Brazil. At first the mission was not very successful but on the 4th or 5th day something happened which exercised a decisive influence for good. One of the missionaries by request called on a sick man and found him in bed half paralyzed. He heard his confes¬sion and, afterwards, pointing to a picture of Gemma that was at the head of the bed, exhorted him to bear his sufferings with the same patience as did the holy Gemma in her sufferings. The poor man began to sob, and his wife, coming into the room, told the Father that he was the brother of Gemma Galgani. The astonishment of the missionary can well be imagined. Indeed Ettore Galgani must have been a sorry sight, for the Redemptorist in telling the story, describes him as an old man, whereas he was only fifty years of age. During the years since he had left Italy, witnesses before the Ecclesiastical Tribunals were describing the virtues of his saintly sister. There was a frequent mention of a brother - unnamed - whose blasphemies on several occasions caused her to sweat blood, who had twice struck her leaving the mark of his fist on cheek and eye, who along with Angela made fun of her ecstasies. One would not then be rash in supposing that this was Ettore, for now in far off Brazil his soul was in a more pitiful state than his ravaged body. A Passionist Brother says: "He was imbued with socialistic ideas and worse" - which may mean that he was a Communist or an Anarchist. He had lost his faith and had married at a civil ceremony only. He had two children – Henry and Gerard, aged 8 and 3 years respectively. Once when Henry was gravely ill, the father was on the point of committing suicide through grief when he seemed to hear the voice of Gemma saying: "Do not add that to so many sins. 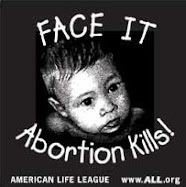 Don't do it and I will take care of the child." In fact, the boy recovered. And now through poverty, suffering and most certainly the intercession of Gemma, Ettore Galgani made his return to God. There was rejoicing in the little town over his conversion, for he had been a scandal for so long and through his influence had brought harm to many souls. 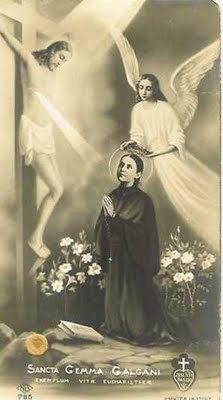 But when it became known that he was the brother of Gemma Galgani, so well known and venerated there, especially among the Children of Mary, all the people began to attend the mission with great enthusiasm. Ettore, now a repentant man, persevered in his good resolutions, spent long hours in prayer and along with his family, received the Sacraments every First Friday until his death, four years later. All this time he was aided by the good Redemptorist Fathers who even supplied him in his poverty with the necessities of life. In 1934, the two boys, Henry and Gerard, were started upon a course of Catholic education given by the Passionist Fathers. Perhaps they saw the vast difference between their father and their aunt. The one, living in rebellion against God, the Church and society, was forced to endure poverty and pain until at the last, the very things he had shunned and the persons he had disliked were, through the Mercy of God, the means of his salvation. And we see how Gemma, now a Saint in heaven, did not forget her brother who was certainly unkind at times to her, nevertheless of whom was the object of her love and intercession and forgiveness in God. It was certainly in part her sufferings and trials that later obtained mercy from God on his behalf. Oh, the adorable Mercy of God and the loving intercession of the Saints! I will close this article with an extraordinary account of a heroic love and devotion that was inspired through the reading of the Life of St Gemma. When Gemma died on Holy Saturday, April 11, 1903, there was little likelihood that this victim would be long remembered except among her relatives and the Giannini family and a few other intimate friends. These indeed would cherish her memory and fondly recall the virtues she practiced and the marvels of divine Grace so abundantly manifest in her soul. But her life had passed too quickly; she had lived in such seclu¬sion that others were scarcely aware of her presence. She went the whole way of the Cross, simple, humble, modest, and mortified. Crucified with Jesus, she suffered awhile and then went quietly to the hoped-for reward. However, God willed otherwise, and thus “the humble shall be exalted” as Scripture reminds us. There was one who remembered her most vividly, who rejoiced on hearing that the story of her life was going from mouth to mouth, that people were reporting favors granted through her intercession. 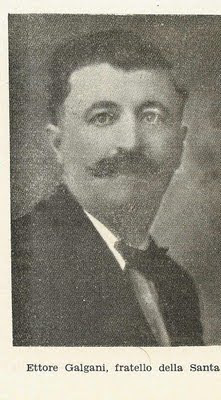 This was her Spiritual Director, Father Germano Ruoppolo C.P. Such interest gladdened his heart and moved him to set about the writing of her Life. He alone was fully qualified to place before the world the beauty of her soul, so resplendent with supernatural virtues and gifts. From September 1, 1900 to April 11, 1903, he had observed and studied her with the greatest care, first to find out of what spirit she was, and then to labor at the work of bring¬ing to greater perfection and lustre this precious gem entrusted to him by the Will of Our Lord. She had revealed to him in word and writing every secret depth of her soul. He had at hand her Diary, her Autobiography and many of her Letters. Certainly everyone would agree that it is impossible to read her writings and not be touched by the fire of her love for God. As an example, in her writings we find the adorable Name of Jesus, whom she loved with all her heart, occurs 1,982 times in her Ecstasies and 1475 times in her Letters, as her devoted Biographers point out. Additionally, Cecilia Giannini, the kind lady who cared for her, along with the grown daughters of the family, took down in writing the utterances of Gemma while in ecstasy and carefully described all they saw in the mystic sufferings. With such abundant and accurate materials at hand, Father Germano began what was for him a labor of love. Lacking money for its publication, he found a generous helper in the parish priest who had baptized Gemma-Don Pietro Quilichi. The book was first published in 1907 and in two months the first edition was exhausted. Within two years there were six printings, and the fame of the saintly Gem of Lucca spread throughout the world. “The Life of Gemma Galgani” was soon translated into English, German, Polish, Portuguese, Spanish, French and Russian. "There was only one Catholic girl at the High School," he said, "and she won the esteem and affection of all by her goodness and keen intelligence. But alas, she died. She died last July (1914) after a month's sickness during which she had read continually a book entitled, 'Life of Gemma.' She breathed her last clasping this book in her hands, while on her face there was a smile more beautiful, purer than any I have ever seen. We who are more or less without any religion, understood for the first time the admirable strength religious faith can inspire in a soul, and we attribute that to the reading of the Life of Gemma. We desire all our pupils to read it and therefore we ask you to forward us copies of that book." In seeking her intercession devout clients of Gemma have come to know her power with God. 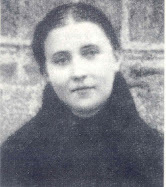 Innumerable miracles have been wrought through her intercession, some of which are found in “The Life of St Gemma” and in her many published biographies of her holy life. "You are great, oh Jesus, but my soul -permit me to say it- my soul will enable Thee to appear greater, because Your mercy will achieve such great victories in me." Thanks to this post I am praying to St Gemma with all my heart she take on the work of conversion of my brother and my other siblings. Praised be Jesus and Mary! Thank you Saint Gemma for the intercessions during in times of my urgent needs. Thank you from the bottom of my heart. Am still waiting for my prayers to be answered by God. All Through Jesus, Mother Mary and St. Joseph. Praise be to God always. I also would like ST. GEMMA to please aid in the conversion of my brothers and sister...and other family members and friends that need it. All glory and honor belong to Our Lord Jesus Christ!! Thanks be to God. In Jesus' name. Amen. 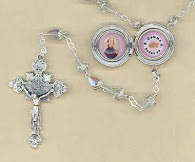 St. Gemma please speak to Jesus and Mary and intercede in the miracle I need for my daughter named Gemma. She needs the assistance of Jesus for nervous and anxiety issues and for the help in passing her Math class in college..